OK, so as I said on my Retina page, I'd like to get my collecting biases on the table: I hate Kodaks! 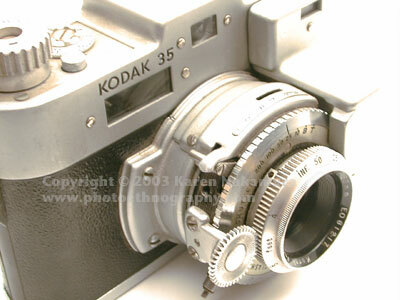 But there's one Kodak camera that is so ugly... that you can only be charmed by it. It sort of reminds me of Bauhaus meets Japanese-robot-animation (mecha). 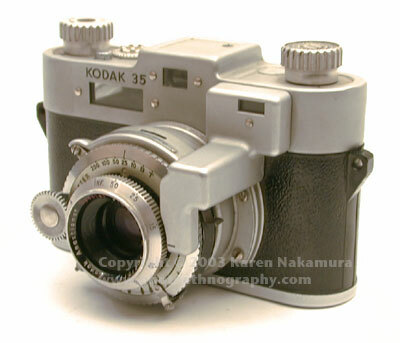 The Kodak 35 Rangefinder has an odd bulbous growth on the front that hides the RF coupling. It looks like it was stuck there as an afterthought. This isn't too far from the truth. 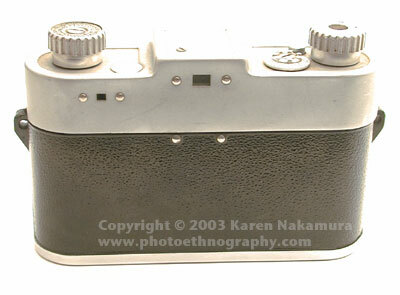 The original Kodak 35 was designed to compete with the Argus A series, but in 1938 Argus came out with their wonderful brick shaped Argus C series with a coupled-rangefinder. Kodak scrambled to add an RF and glommed on a RF to their bakelite model. This camera was pure Made in USA technology and ingenuity. Unlike the Retina series, which is/was Teutonic to its roots and aimed for quality regardless of cost, the 35 RF was designed for the masses and for low cost. Instead of machined brass and steel, we have stamped alloy and cast bakelite. A sticker on the inside of the camera admonishes the user to only use Kodak film, and gives patent dates of 1938, 1940, and 1942. It has the same shiny film pressure plate as found on the Bolsey cameras. This means that you should only use negative (B&W or color) film with these cameras and not chrome positives (slide film) which does not come with an anti-halation layer. Infrared film will also act very funny, creating a literal mirror-image. Now, this camera has a focusing knob on the front left of the camera that really serves no purpose except to ape the Argus 'C' camera it was competing against (or perhaps in concept, the Zeiss Contax camera). The shutter advertises that it's flash compatible, but it uses a proprietary system that isn't compatible with current flash units (unless you can find the rare adaptor somehow). OK, so the camera looks like your typical leatherette covered brass or alloy, right? Nope! The black portion of the camera is actually bakelite. You can tell when you look at the strap lugs, which are molded bakelite. Again, thank you for all the information on the webpage. I own my Grandfather's 1946-vintage Kodak 35 RF. I also have boxes and boxes of his Kodachromes that show that it was indeed a pretty good picture taker back in his day. However, without a doubt, it is one of the most user-unfriendly cameras ever made. The unit seems to be in order, but I have yet to be able to successfully get film to wind into it without tearing out the sprocket holes. And there's nothing like focusing a camera by putting the tip of your finger on a spiked wheel and moving it back and forth. 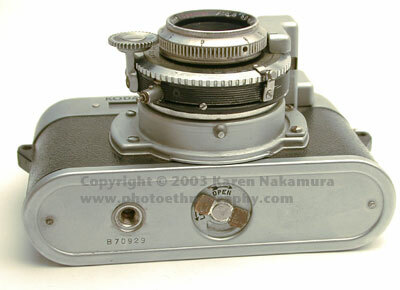 I do want to ask you about the "shiny film pressure plate" and not using these cameras with slide (transparency) film. 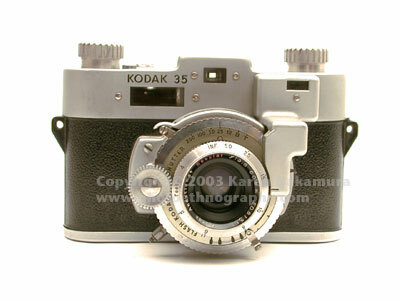 Both this camera and the Kodak Pony 135 Model B I have possess the "mirrored" film pressure plates. However, both of these cameras have successfully taken literally thousands of slides over the years (old Kodachrome, mostly, but up through at least the Ektrachrome 64 era). In fact, when both of these cameras were being marketed, they were marketed as "color" cameras, and the only color film Kodak made at the time in 35mm was Kodachrome. My Mamiya/Sekor 500 DTL may also have a "shiny" pressure plate (can't tell you right now because there's film in it), but I've successfully shot Ektachrome Infrared in it. I do think that people make a bigger fuss about the shiny backplates than is really needed. Perhaps if you were shooting really high-grain film, you might notice a smidgen of a difference. I think the shiny backplate might actually serve a positive purpose in increasing the low-light sensitivity to film (much like the reflective retinas of cats and dogs). Karen, I believe that's as good a reason as any. If I recall correctly, original Kodachrome was around ISO 12, so increased low-light sensitivity might have been a goal. Right now I'm finally getting around to sorting through literally thousands of slides dating back to the 1940'a. Many of them were taken with the Kodak 35 RF. I was amused to note that there are a LOT of slides where the framing is way off center, and came to the realization that they were probably the result of focusing the 35RF through the rangefinder window and not switching to the viewfinder for composition!